Walk off the busy street into 640 North Broad and enter an urban space that combines the old with the new. Feel the past mix with a refreshing dose of hip, understated sophistication. The original character of the building is not lost but enhanced by modern accents and furnishings. 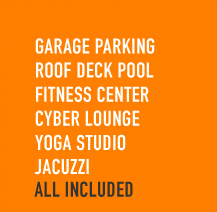 A thriving community dwells within our walls -- a state of the art fitness center, cyber cafe and yoga studio serve to nurture body, mind and spirit. Setting the night sky aglow, our glass-domed pool house is the perfect place to unwind. 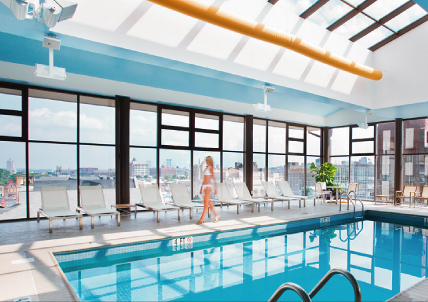 Go for a swim in the warm saltwater, relax your muscles in the Jacuzzi, or meet and socialize on the roof deck lounge. Enter the lobby, your public space. Experience orange as it bursts in the artwork and pours from geometric ceiling lights that warm the mocha-colored floors. Accented with a healthy dose of pure white and stainless steel, contrast brings together the energizing elements of your entrance. Philadelphia reinvents itself in Fairmount. Lofts 640 is just six (6) blocks north of City Hall on Broad Street. Lofts 640 is centrally located to Philadelphia shoppes, restaurants, hospitals and the thriving community of Fairmount. Minutes from Reading Terminal Market and the Pennsylvania Convention Center, Lofts 640 combines commuter convenience of center city living with spectacular urban spaciousness of true loft living.